On top of last year’s 2015 F-150, the collision repair industry should prepare for more aluminum vehicles from Chrysler (FCA), Ford and General Motors in the second half of the decade. That was one of the pointers offered in a webinar on aluminum and auto body work offered Tuesday by the Auto Body Repair Network and hosted at Carstar Carcraft in Chesterfield, Mo. The video features ABRN managing editor Krista McNamara, 3M senior technical service director Shawn Collins and Carstar assistant vice president Rick Miller. “As the Ford F-150 all-aluminum-body pickup rolls into dealerships across the country, our collision repair professionals are faced with a new challenge but also a new opportunity in repairing these vehicles,” McNamara said in the webinar. 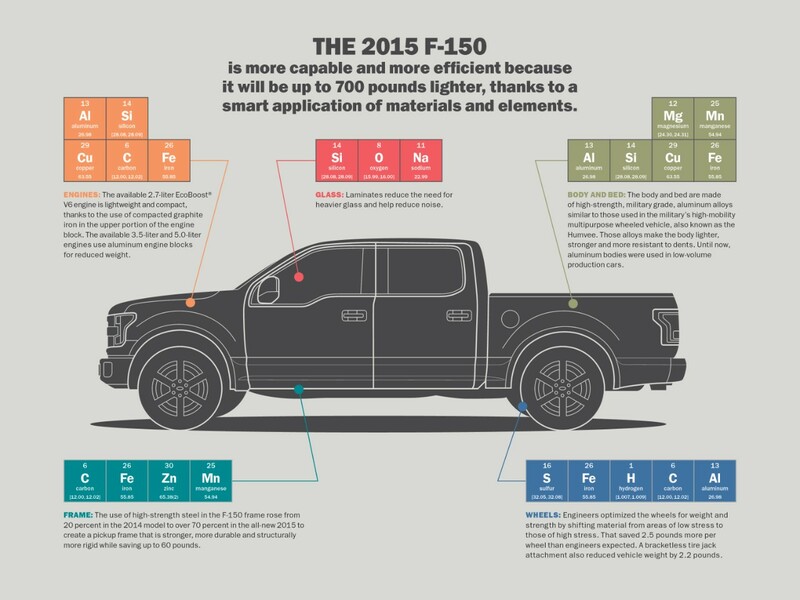 Collins concurred, calling the F-150 “a big change for the industry” but a trend likely to continue because of federal fuel standards requiring 50 mpg fleets by 2025. Ford is looking at expanding its aluminum line to the Explorer, Expedition and Super Duty for either the 2018 or 2019 model year (it was unclear from the presentation) and the Fusion at some point soon, according to Collins. GM will make the 2018 or 2019 Silverado out of the element as well as the 2018 Escalade, Tahoe and Yukon, according to Collins. FCA will construct the 2017 Jeep Wrangler out of aluminum too, Collins said. Larger vehicles can shed 700 pounds with the metal, and smaller ones can drop 400, Collins said. Plus, it’s the “most readily available metal on earth,” he said. Downsides, of course, are that aluminum “has no memory” and takes a lot of effort to repair. For example, an aluminum job can take up to 4,000 rivets and 150 yards of adhesive. Plus, the tools and training you need can cost $50,000-$200,000 for structural aluminum repair and $18,000-$25,000 for nonstructural work, Miller said. So before you buy in, make sure it’s worth it in the near term for your business, he recommended. For multi-shop operation franchisees in a single market, Miller recommended talking it over and having one shop be the go-to option for aluminum structural work while a couple of others take on the nonstructural collision repairs for the area. (It’d be interesting to be a fly on the wall for that discussion.) This might be a way for an independent owner to lighten the aluminum capital costs for his or her smaller network, too. FOR06: The F-150 structural course. They also recommended taking ALI01, APR01 and “STA01” (We couldn’t find this one either.) courses and making sure whoever you send to all of these courses is steel welding certified. Miller suggested sending your best, most enthusiastic technicians to the training. You don’t want the “that’s how we’ve always done it” guy that’s being dragged kicking and screaming into aluminum repair. Separate steel and aluminum. You will need a special area set aside for aluminum to prevent dust corrosion from working on steel and aluminum vehicles near each other, and you will also need a separate set of tools for aluminum (not just the obvious ones that are aluminum-specific). Steel mostly corrodes aluminum, but aluminum can corrode galvanized steel. Consult the OEM: Ask the OEM of whatever vehicles you’d like to work on what they recommend and require for doing the job. Use 3M? : Collins offered a lot of plugs for his company’s products during the webinar. (Instructor’s prerogative.) However, in his defense, he also said all of them had been “tested and approved” for aluminum work, and two of them — a file belt tool and accessories and a panel bonding adhesive — had been specifically recommended by Ford for fixing an F-150. “It’s really no different,” he said, than adjusting to waterborne paint or high-strength steel.